We are only a few days away from the 2019 SR-7B Conclave at Camp Durant this weekend (April 12th-14th, 2019). With a few days left the chapter has a lot of information to tell you. So below are very important information about this weekends hype event. 1) When you come to Conclave bring your BSA Medical Form part A & B, if you don’t bring it to Conclave you will be asked to leave because those forms are like your “Golden Ticket” to enter into Conclave. 3) The Occoneechee Lodge 104 Trading Post has officially sold out of 2019 Conclave t-shirt’s. If you ordered one you will get it at check in at Conclave. 4) At Check-in certain people will need to go to certain places to check-in. Below are the places where you will need to check-in. This is for Staff and Lodge Delegates, so look carefully at where you will need to check-in. Check-in begins at 2 pm and will end at 10 pm. a) At Conclave, Occoneechee Lodge 104 will be staying at Poplar, Hickory, and Sweetgum Campsite. For those who went to Spring Pow-Wow, you will remember that the lodge wanted us to set up the canvas tents at our campsite, well this is why because at Conclave people will be allowed to camp in the canvas tents. The Canvas Tents will be determined by a first come, first serve bases. b) For a few committees, they will stay somewhere else at Conclave due to their job responsibilities. Cook Crew (Food) will camp at Maple Campsite, Shooting Sports and Chaos Committee will stay at Long Leaf Campsite, and Health and Safety Committee will stay at the Health Lodge. 6) Our Chapter Chief- Alberto Daniel, will be running for a Section Officer at the Section Elections. Alberto will be running for Section Secretary, he will need everyone’s help to campaign. The Section Election will occur at 4pm on Saturday Afternoon on the Vista at the stage. The rain location is the Grand Lodge. Please help Alberto become Section Secretary. 7) The Saponi Chapter Pre-Ordeal Ceremony Team will be representing Occoneechee Lodge 104 at the 2019 SR-7B Conclave and will compete against the section to become the best Pre-Ordeal Ceremony in SR-7B. They will perform starting at 9 am at Beech Campsite Field (Rain Location: Sullivan Center). We will also have some of our members compete in the Brotherhood Ceremony starting at 9 am at the Campfire Arena (Rain Location: Archery Shelter). Please come out and support our fellow chapter members as they compete against some of the best ceremony teams in SR-7B. More Updates will appear before Conclave. So look at this article each day for updates about Conclave. March Saponi Chapter Meeting: At the 2019 March Saponi Chapter meeting the chapter had a visit from the 2019 Conclave Chairmen John Sommers and Occoneechee Lodge 104 Vice Chief of Communications Parker Morreissett. We started out with a presentation from John Sommers about the 2019 SR-7B Conclave, then the chapter had a egg toss competition. Other members practice the Pre-Ordeal and Brotherhood Ceremonie so that way they can be ready to preform at Spring Pow-Wow. After the egg toss and ceremonie practice the chapter got to schedule transportation to Spring Pow-Wow and others went and got their pizza. For the game we had a Brotherhood Family Feud to help our Brothers who were seeking the Brotherhood membership in our order. It went great! 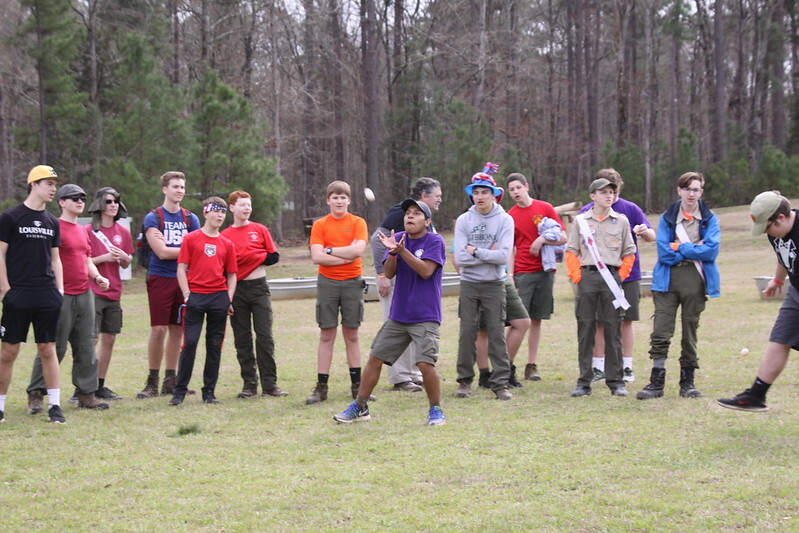 The March meeting was a lot of fun and many Arrowmen were ready for Spring Pow-Wow, April Chapter Meeting, and the 2019 SR-7B Conclave. April Saponi Chapter Meeting: At the 2019 April Saponi Chapter meeting, the chapter had a new members pot luck. Where fellow Arrowmen both youth and adults brought food for the chapter meeting to welcome our new brothers into the Order of the Arrow. During the meal, the chapter went through a presentation by our Chapter Chief-Alberto Daniel. All about what opportunities the Order of the Arrow offers. The Order of the Arrow offers great high adventure programs, leadership opportunities, and more! Once the presentation was over the chapter then had a challenge to complete, they had to get into groups of 5 to create a lip sync song for the chapter to preform. The chapter members will preform these songs at the May 2019 Saponi Chapter meeting on May 6th, 2019. Chapter Chief Alberto Daniel catching the winning catch of the Egg Toss at Spring Pow-Wow 2019. October 1st, 2019 – Saponi Chapter Meeting: 7 pm – 8:30 pm at Orange United Methodist Church in Chapel Hill. Saponi Chapter Elections for Chapter Chief, Vice Chief of Program, Vice Chief of Admin North and South, Vice Chief of Communications, Vice Chief of Finance, and Vice Chief of Fun Stuff. October 19th – 20th, 2019 – Vigil Gathering: At Camp Durant for Vigil Members Only! AIA Competition – Ceremony, Singing, Dancing, and Drumming: you can watch and if you would like to participate email alberto.daniels10@gmail.com. Conclave Preparation – If you are staffing at Conclave, your committee may want you to staff at various things. For example, if you are in Registration- you have to check-in people, Grill- may have to help at the grill, Trading post- work at the trading post. Ordeal – Serve as an Elangomat. If you do you get a free t-shirt, $10 at the trading post and grill, and a patch. Brotherhood Trail – You can become a Brotherhood member, serve as a Nemat, and/or help at the Brotherhood Trail. To be elugible to complete your Brotherhood Trail you must have been an Ordeal member fro atleast 10 months and write a letter to your lodge of why you should be a brotherhood member and what you will do for your lodge. The Quest for the Golden Arrow – The events are the following: Egg Toss (Chapter Chief and Chapter Adviser), Tug-o-war, 5-legged race, Rowboat Carry, Giant Cup Pong, and Car Wash.
Family Feud Theme – Alberto has the suite, cap, and mustache. Please bring Speakers like Bluetooth speakers or MVP players so we can play the Family Feud music. Contact our Chapter Chief if you have any for Spring Pow-Wow. Spring Pow-Wow Attendance Challenge – Alberto has issued a challenge to the chapter. If the chapter has more than 25 Arrowmen (Youth, Youth+, and Adults) sign up and attend Spring Pow-Wow, the chapter members will get to see the Chapter Vice-Chiefs pour ice cold water on the Chapter Chief at the April chapter meeting. If the numbers are not met, the Vice Chiefs will then get pied by whip cream at the April Chapter Meeting by the Chapter Chief. (Note: I do not want to get pied by Alberto, so please sign up for Spring Pow Wow). That sounds a lot of fun, so sign up for Spring Pow Wow at: https://lodge104.net/registration/. Plus pay your OA Dues! Only cost $15.00. At the Saponi Chapter January Meeting, the chapter had the Occonechee Lodge Chief Michael Glennon(Illua Machque) and Vice Chief of Communications Parker Morrissette(Netami). The chapter even had the SR-7B Section Secretary Connor Bardin(Kiowa) and the 2019 SR-7B Conclave Chairmen John Sommers(Illua Machque). This meeting became a record for the chapter for most lodge and section officers at a Saponi Chapter meeting and the largest amount of section officers at the meetings. At the meeting, the chapter went through Unit Election Training which was conducted by the Occonechee Lodge Unit Election Chairmen Jessie Shipman(Eluwak Chapter). Jessie gave a great presentation of how to conduct an OA Unit Election and what the values you get from doing an election. Next, we had John Sommers talk about the SR-7B Cardinal Conclave that will be at Camp Durant on the Weekend of April 12th-14th. If you haven’t registered, then register by www.sr7b.org. After the Conclave information, we then went into the chapters White Elephant Gift and Pizza. Arrowmen got a reindeer inflatable game, a free pass to 1 lodge event in 2019, NOAC 2018 Patches, a 2-pound Gummy Bear, and more. The gift exchange was a lot of fun and thank you to those who participated. After the gift exchange, we had pizza and a chapter trivia game of 2018. Arrowmen left the meeting with excitement for 2019 and left pretty hype and ready for the next meeting. The next Saponi Chapter meeting is on February 4th, 2019 at 7 pm at Orange United Methodist Church in Chapel Hill. Wear your class A with OA sash and bring $2 per every slice of pizza you want. If you want to know more information about the chapter, meetings, etc. please contact the Saponi Chapter Chief at saponicheif@lodge104.net.